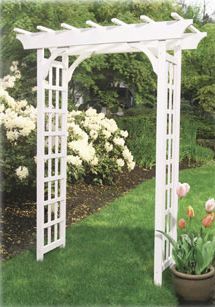 The Cascadia Garden Arbor is the same style and design as the Rosedale Garden Arbor, but the Cascadia is finished in a white color. This arbor is finished with 2 coats of primer and can be easily painted whatever color you wish. The Cascadia draws your attention and becomes a focal point to your garden or front entrance. Made from premium Western Pine. The Cascadia is a well-proportioned and handsomely detailed pergola-style arbor. Curved and rounded corner braces add rigidity and echo the circle-cut tips of the 2" x 6" headers. Rounded trellis ends lend a custom touch. Width opening is adjustable, from 36" up to 48" inside. Please click here for Cascadia Arbor Instruction Manual. For lasting strength, the pre-assembled side panels feature furniture-style, mortise and tenon joinery of rail to posts. To support demanding climbing plants the heavy duty lattice panels are glued and stapled at every joint and set into channels in the surrounding frame. Staples are aluminum and won't bleed. To accommodate varying path widths, the Cascadia has an adjustable opening width with pre-drilled settings of 36, 42 and 48 inches. Includes 4 galvanized steel anchors for securing arbor with cement.